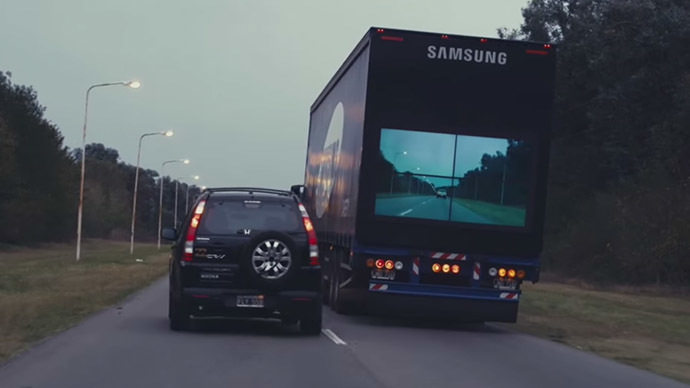 The Korean tech-giant Samsung has created a ‘Safety Truck’ which aims to reduce crashes when drivers attempt to overtake long vehicles on one-way roads. The solution is quite straight-forward using cameras, wireless video feeds, and huge display screens. The technology was inspired by the high incidence of traffic accidents in Argentina, where almost one person dies in a traffic accident every hour. Almost 80% of fatalities happen on roads and the majority involve attempts to overtake on one-way roads, according to Samsung’s estimates. The Safety Truck is a bit different from its fellow gigantic vehicles - instead of obscuring most of the view, it actually shows the driver what’s going on ahead of the wheeled leviathan. Cameras installed in the front of the long haul vehicle capture real time video of the road ahead and transmit it in real time via wireless feeds to four big screens on the back. The cameras also have a night vision setting to make drivers aware of their immediate surroundings. The technology was developed in partnership with advertising company Leo Burnett and Argentinian tech group Ingematica.